Small garden advice t-shirt. Text reads, Cultivate lasting friendships. Sow seeds of kindness. Listen to sage advise. Don't let the little things bug you. Be outstanding in your field. Take thyme for yourself. No vining! 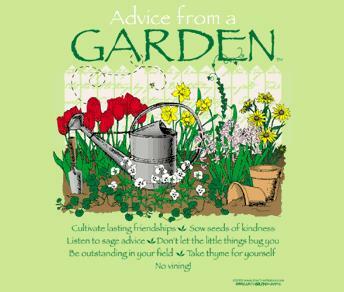 Advice From a Garden will delight any garden lover or self-help enthusiast.